Irish artist Nevan Lahart attended Limerick School of Art and Design and the National College of Art and Design. Working in a range of media, Lahart considers topics including the role of TV and the media, social and political perceptions, and the Museum as purveyor of artistic merit and classification. Lahart has exhibited nationally and internationally since 2000, including solo exhibitions at Temple Bar Gallery and Studios, Dublin; Steve Turner Contemporary, Los Angeles; Solus Nua, Washington DC and Catalyst Arts, Belfast. He participated in IMMA’s Artists’ Residency Programme in 2005. Nevan works in a wide variety of media. 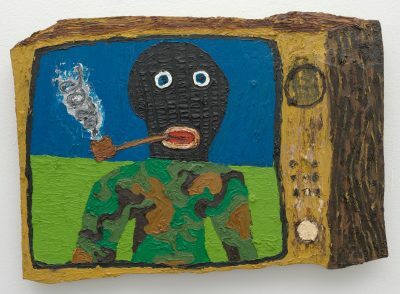 The subject matter of his work could be very loosely described as encompassing television, the media, social and political perceptions and the history of art and life as he finds it. Nevan is interested in the role that the Museum plays, as a purveyor of artistic merit and classification and societies neutralising agent of assimilation (adoptive negation). Nevan aims to engage in creative collaboration with the public, but hasn’t a clue what he’ll do yet; take it that he’ll wing it in a spoofing free style manner. Nevan Lahart’s work is in the Process Room, West Wing, First Floor Galleries, IMMA, until 16 October 2005.